Dossouye, a female version of Imaro in many ways; just as entertaining. A solid entry in the Sword & Soul subgenre by the man who started it, Charles R. Saunders. Highly recommended for fantasy fiction readers. Sword & Soul & Availability: Charles R. Saunders led the creation of the Sword & Soul sub-genre (under Fantasy). My previous review of Saunder’s more famous, male character Imaro details more about his writing history. In short, he was compelled to create myths stemming from Africa rather than the typical European-centric standard. He spins a good tale, and his perspective does feel fresh. Like Imaro, Dossouye is a essentially a lone warrior (she does have a trusty mount called Gbo, a war buffalo!). Do not expect elves or party/fellowships. Do expect to experience strong mix of sorcery/magic, creatures (supernatural and wild), and lots of fighting. Some of his books are difficult to track down, but they are worth it...and... he has been writing many short stories (those count too for Dossouyediscussion...so if you can't find the books, look into the anthologies he contributed for....list below). 1 – “Agbewe’s Sword”: Two cultures, the Abanti and Abomea, battle with sorcery and buffalo mounts. Dossouye is introduced, chosen via a bokono dream, and eventually exiled in a unique way. 2 – “Gimmile’s Songs”: A chance encounter with cursed magician/musician and thieves that follow him. 4— “Yahimba’s Choice”: Tarusi (realized forms of mens’ fear of girls not getting circumcised) take center stage. Best story in the set. With Saunders already infusing black history into dark fantasy, with this collection he strived to go further by taking on a woman’s character. From the outset, I had in mind doing some type of Bechdel-Test (one measure of how well women are portrayed in movie scripts in relation to male dominance). For this, I mentally noted how much Dossouye was just a “chick-in-chainmail”; ie how often did her gender really play a role in the story and not just be easily replaced/switched for a male stand-in. 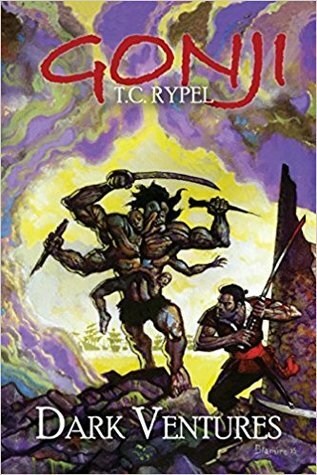 Although female issues are mentioned throughout, it wasn’t until this chapter did Saunder’s hit his stride across the board: African culture & myths, Dossouye’s gender, and classic Sword & Sorcery (battles with supernatural) all synchronize. The short stories flow as connected chapters, but the publication/creation history still affect the read. Saunders has a narrative voice that leans toward “telling” rather than “showing” but the plots are full of twists and milieu so unique that they read fast. Dossouye’s main motivation/choices stems from a culture around associating one’s three souls with feti trees. Without the trees living, one may turn into a zhumbi (a soulless Abomean). To achieve a 5-star, this critical relationship needed to be fleshed out earlier (or “shown” more). That said there is a sequel, and Dossouye evolved into a more realistic character with each story. The next one should be a great read too. Short stories: From his website Saunder’s author page we can get a list of Charles R. Saunders's short stories and the collection they appeared in. 2017 and beyond This April, Sword and Soul guru Milton J. Davis revealed that “A few years ago Charles Saunders shared with me an excellent story he wrote set in the world of Imaro titled 'The Return of Sundiata. Just recently he revealed to me that he has written a collection of such stories, tentatively titled 'Nyumbani Tales.' It is my honor and privilege to announce that I will be publishing this historic collection this year! Stay tuned for more details. Sword and Soul forever!" In short, The Children of Húrin is very Tolkien... but much more dark/grim than most people have read. I own the Alan Lee illustrated version and the audiobook narrated by none other than Saruman-actor Christopher Lee. Extremely dark! A dense read made easier by the narration and tenor of Lee. Listening to C.Lee while looking at A.Lee's illustrations (who was concept artist for the movies too) is a great experience. 2) Evil villain-god Glaurong is a servant of Morgoth, once named Melkor whose lieutenant Sauron appears in LOTR; Morgoth has a large role in this book. 4) Abandoned Dwarf place: in the Hobbit and LOTR we were treated to ruined Dwarf holds (Erebor and the Mines of Moria); here we have the petty-dwarf Mim and his abandoned hold Amon Rûdh. 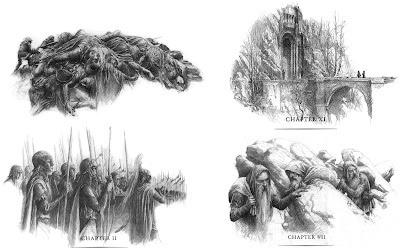 These Tolkien-tropes reinforced my take on the Hobbit and LOTR's themes; if you've read those and are entertaining reading the Silmarillion, I suggest reading Hurin first. It is easier to read than The Silmarillion and expands the milieu well. The Children of Húrin really extends the World of the Hobbit and Return of the King. Easier to read than the Similarion, but still pretty thick. From this I learned lots of nuances (like Elrond is half-human). Would make an awesome movie (which will not happen :( ). Highly recommended.